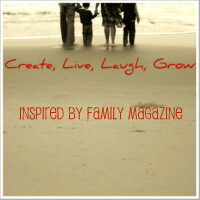 A Mom Not a Professional Nor a Perfectionist: Featured at Foodie Friday! Over dinner I am sharing with my husband my excitement (a little toned down for his sake) about being featured by another blogger. With much enthusiasm I began explaining to him how the blogging world works ( I really don't know the ins and outs but I am explaining it like I wrote the manual) and as I am talking it hits me HE DOESN'T GET IT. He was being a great listener and supportive by asking questions but the look on his face told me "just stop". 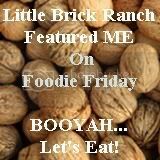 All that to say I was estatic to discover that the very cool blog Little Brick Ranch featured my recipe on their Foodie Friday post! !